Freestyle Fish 'n' Chicken Is Now Closed. 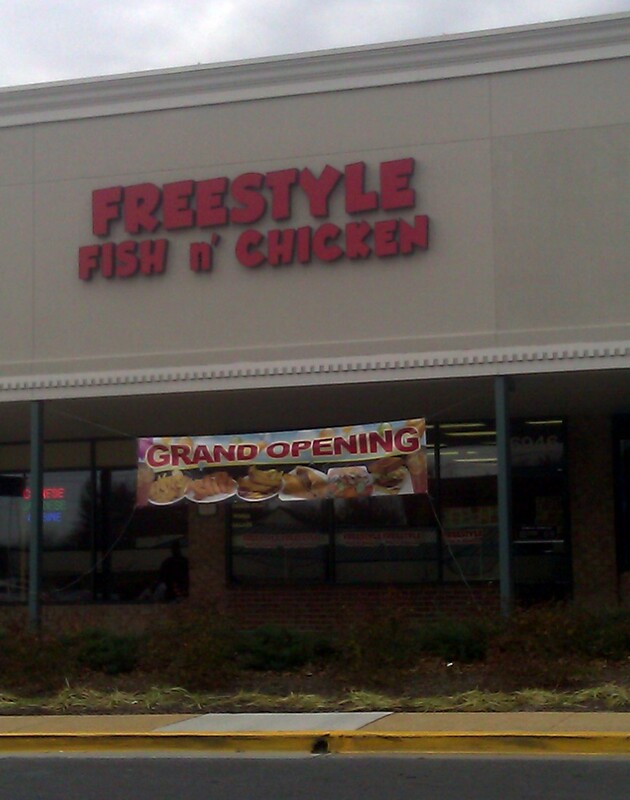 Freestyle Fish 'n' Chicken, 6946 Laurel-Bowie Rd. I don't really like fried food. Well, French Fries, done well, are pretty tasty, but in general if my choices are "grilled" or "fried", I'll pick "grilled". So I'm a little biased against this place to start. The first time I went there, I decided a good sample would be chicken tenders and catfish nuggets. It was...OK. Probably better than the KFC that used to be housed there. The fries were mushier than I'd like. 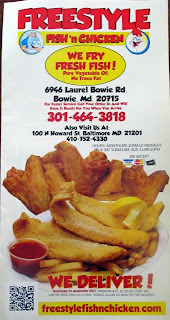 On my return visit, I got the fried tilapia and chicken wings. The tilapia was the best thing I've had there, and the chicken wings weren't bad. 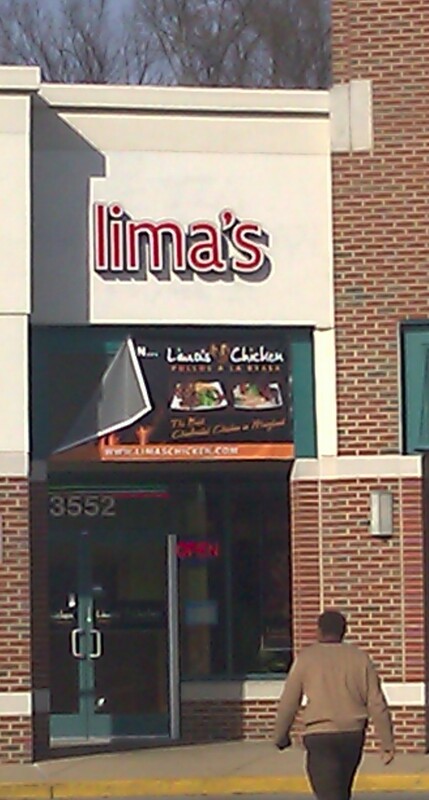 Still, if you want chicken, I have to recommend heading to Lima's Chicken. If you insist on having it fried, the chicharron de pollo isn't bad, though I still prefer the non-fried alternatives. I guess if I find myself in Bowie Plaza looking for a quick meal, I might pick this for variety instead of Subway. If it's not breakfast, I'd give it a try over Dunkin' Donuts. I'd definitely go there before Burger King. But I'd generally wish I had the time to enjoy TJ Elliott's or Golden Pavilion. So it gets an unenthusiastic two-and-a-half stars. 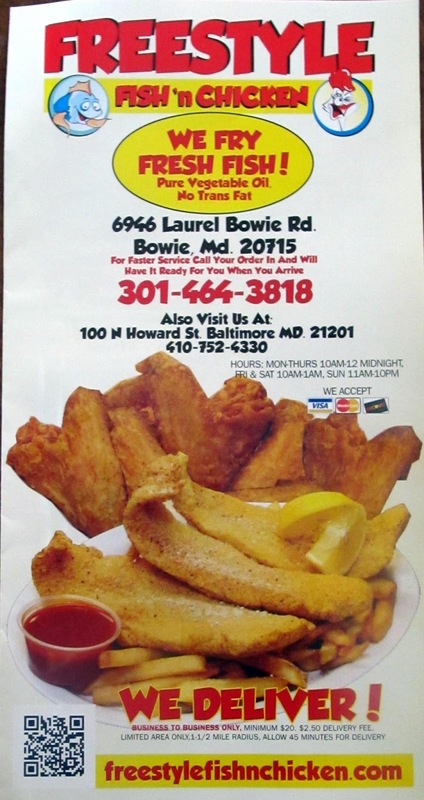 If you like fried food, or you happen to end up there, you'll do OK, but there are generally better places to eat in Bowie. The City of Bowie's 2013 Restaurant Guide is out. New this year is that they designate places outside of the City of Bowie with asterisks. I'm not counting those in my total. The Subway in the Sunoco on Ballpark Road doesn't have an asterisk. Given that earlier this month, Bowie police responded to a burglary at the Sunoco, I thought I'd better reconsider my belief that it's not in Bowie. But if you want something definitive, go to the tax records, which show no municipal tax assessed on that address. So I stand by the claim. The White Tiger in the food court is now closed. Sixty-three down, seventeen to go! 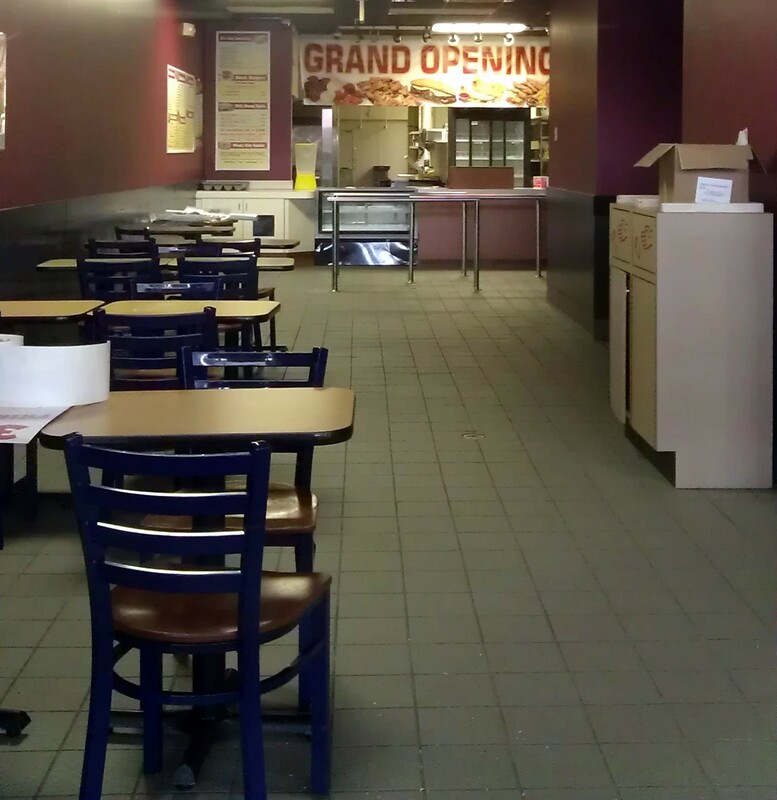 Lima's Chicken, 3552 Crain Hwy. When I found out that Lima's was open, I stopped by to grab a menu after picking up lunch elsewhere. With the smell of roast chicken suffusing the restaurant, I questioned my decision to eat anywhere else. Since then, I've visited Lima's three times in a week and a half. That number, however, is artificially lowered, because my first visit was for takeout. Christina was concerned that the chickens might be small, so we got their "Family Special" -- two chickens, four side orders and a 2-liter bottle. They weren't -- we had leftovers for a week. They were delicious, as were the side orders -- plantains, yucca, beans and fresh veggies. My only complaint is that somehow we ended up with beans instead of rice and beans. My next visit was to pick up some tailgating food for the Redskins playoff game. For the first time, I got to try "salchipapas" -- a Peruvian concoction that mixes hot dogs, French fries, ketchup, mustard and mayonnaise. It was exactly as disgusting and delicious as you might expect. I don't usually like mayonnaise, but this was closer to a high-quality European mayonnaise than something out of a jar from a supermarket. 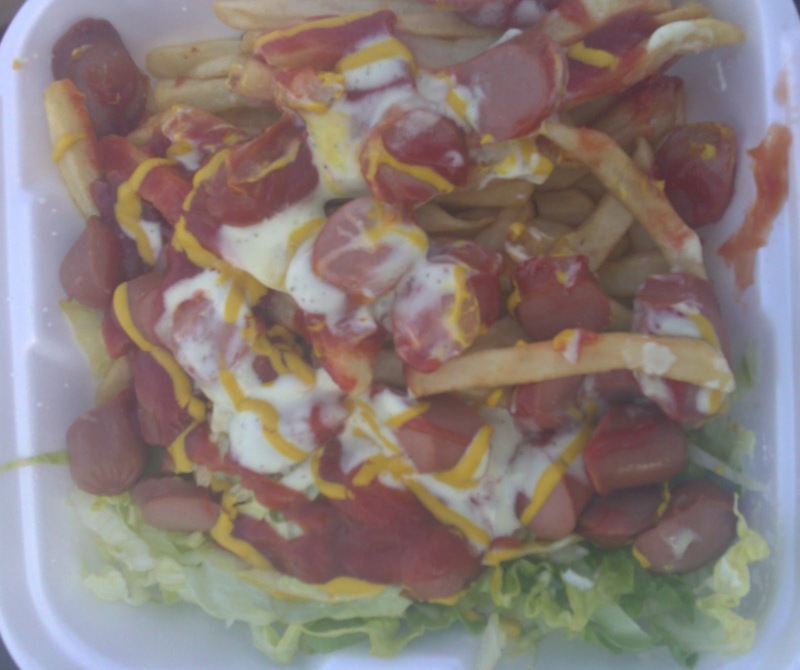 I think salchipapas are now an indispensable part of the tailgating experience for me. At the suggestion of the guy behind the counter, I ordered the Pollo Saltado, described as "Chicken with onions and tomatoes served over french fries and rice." I wasn't expecting much difference from the charbroiled chicken, and I thought onions and tomatoes weren't the best sides. What I ended up with was chicken that had clearly been cooked together with the onions and tomatoes and blended the flavors together in a delicate and interesting way. My third visit was with two colleagues, and we ran into another co-worker once there. Three of us got the 1/4 chicken (comes with two sides), and the fourth got a gyro. Everyone was very happy with their meals. The menu seems to divide into three parts. There's the charbroiled chicken, which forms the heart of the restaurants. At $6.25 for a 1/4 chicken, prices are better than Boston Market, the food is more interesting, and the chicken seems to be higher-quality. Then there's the Peruvian specialties -- not the heart of the menu, but you have the option of getting actual beef heart skewers (Anticucho Corazon). Entrees range from $8.99 to $14.99, so you won't be getting as much of a bargain. Still, if the Pollo Saltado is representative, these items are worth trying from time to time. Finally, there are some non-Peruvian items on the menu -- salads, burritos, tacos, even a hamburger. I could be wrong, but I only can see being tempted by items containing chicken. I'm not sure why I would order a burger here. Note that the menu board doesn't entirely match the printed menus. I couldn't find the salchipapas on the menu board, and there's a $5.49 lunch special that wasn't up there either. Lima's is well on its way to becoming my favorite Bowie restaurant. 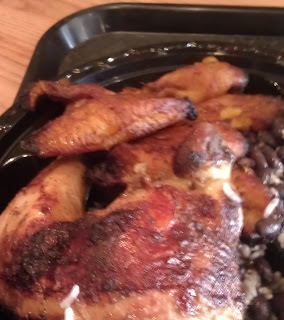 I said in May, "Bowie needs a Peruvian chicken restaurant." Now we have one, and it's great. I was torn between 4.5 and 5 stars. To me, a 5-star restaurant is one worth coming to Bowie to eat at. Although there are other Peruvian chickens in Maryland (Laurel, Annapolis and Beltsville being some relatively nearby ones), I think Lima's comes close to meeting that standard. I haven't eaten at all of its competitors, but this is definitely the best I've had. Maybe I'd want to see a full-scale restaurant with table service to award 5 stars. Or maybe I'll look back in a few months and wish I had just gone ahead and given it 5 stars. 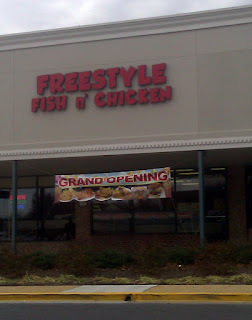 Freestyle Fish N Chicken in the Bowie Plaza shopping center still has blacked-out windows, but if if you peek in, they look ready to go with a "Grand Opening" sign in place -- that's been true for about three weeks now. I'm not sure what the holdup is. 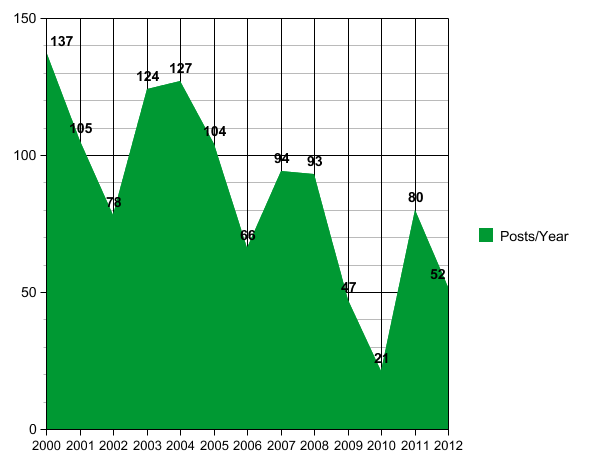 At the beginning of 2011, I lamented the steep decline in my posting output here. Last January, I celebrated a rebound. So how'd I do in 2012? 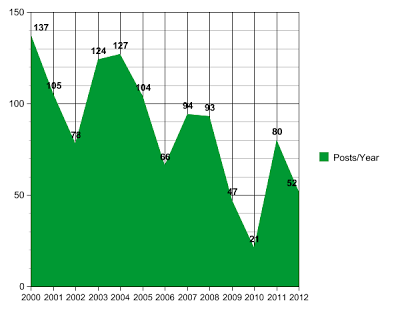 About halfway between the depths of 2010 and the recovery in 2011. I used labels on every post last year, but the first, which shows me that my Bowie Restaurant Project contributed the majority of posts, with books in second place, and other topics (travel, nostalgia, geocaching, genealogy, etc.) contributing a handful. In 2013 (I find it hard to believe that's a real year), I guess I'd like to bring the restaurant project to a close, review more books, and start posting more about travel, even if I don't travel very much. With the books, it's hard to have the discipline to write a review while the book is fresh in my mind, and a month or so later, the typical review feels like, "Oh, yeah, that book was pretty good, except for this aspect." On the travel, I've gotten into the habit of posting photos to Facebook. While I like limiting the exposure of some stuff, most of my travel photos have no privacy implications, and the blog allows me to weave a more complicated narrative than Facebook does. So I'd like to post more this year, but I won't be too sad if I end up around 52 again.